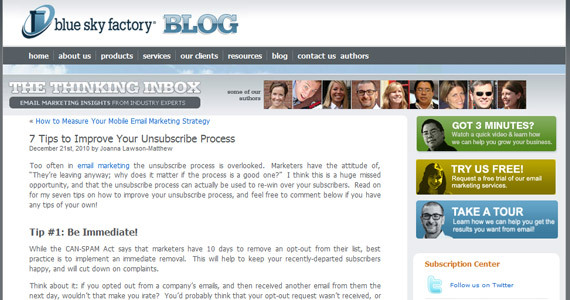 Too often in email marketing the unsubscribe process is overlooked. Marketers have the attitude of, “They’re leaving anyway; why does it matter if the process is a good one?” I think this is a huge missed opportunity, and that the unsubscribe process can actually be used to re-win over your subscribers. Read on for my seven tips on how to improve your unsubscribe process, and feel free to comment below if you have any tips of your own! While the CAN-SPAM Act says that marketers have 10 days to remove an opt-out from their list, best practice is to implement an immediate removal. This will help to keep your recently-departed subscribers happy, and will cut down on complaints. Think about it: if you opted out from a company’s emails, and then received another email from them the next day, wouldn’t that make you irate? You’d probably think that your opt-out request wasn’t received, or was ignored, and you’d end up hitting the big old “This is Junk” button, thus registering a complaint. Remember: the typical subscriber isn’t as email savvy as we may think they are, so they won’t necessarily understand that you have a 10-day leeway to remove them from your list. Nor will they care – they’ll expect to be removed immediately! Respect and honor your subscriber’s wishes, and make sure their opt-out requests are taken care of and acted upon immediately. 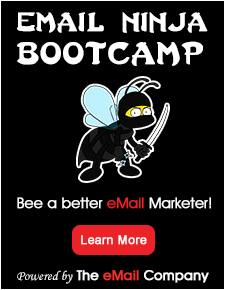 If you’re using an email service provider (ESP) to help you with your email campaigns, you should be able to take advantage of their immediate, maybe even “one-click”, opt-out mechanism.